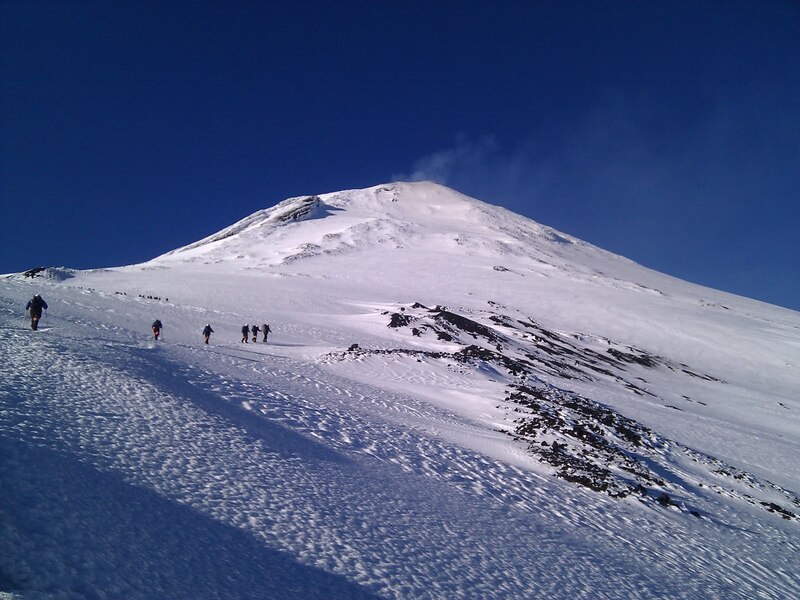 Volcan Villarrica towers over the Chilean town of Pucon, its snow covered summit dwarfing the surrounding mountains. I was unsure what to expect on this walk - the hostel provided a full, and I mean full, set of kit - crampons, helmet, trousers and gaiters, boots, jacket, mittens, ice axe, plastic sledge and a sort of fabric nappy for sitting on (more on this later)! 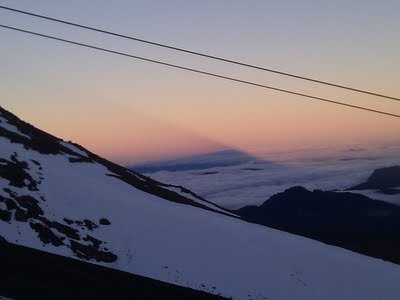 Fourteen of us set off in the dark, a minibus for the drive from Pucon at 227m above sea level to the starting point, where the road ended at approx 1,450m. We began walking, still in the dark, to the bottom of a chairlift, just a few minutes from the car park. Here, most of the group paid an extra 5,000 Chilean Pesos for the lift, while three of us walked the path under the lift, climbing 400 metres in 45 minutes. There were lots of groups of walkers about already and it was good to have the path almost to ourselves. The view behind us was of Pucon and Lago Villarrica and the mountains that previously looked big from the town, already appeared small as we rose above them. At the top of the chairlift we donned helmets and carried our ice axes, now walking on a mix of rock and patchy snow and ice. We soon caught the rest of the group and enjoyed the sunrise as we continued on a steep climb, switching back and forth as we went straight up the mountainside. When the rock had disappeared and everywhere was snow, we paused to put on the crampons, first cutting a seat into the ice with the axes. The slope was steep enough here that anything dropped would rapidly disappear down the mountain. We were treated to a blue, cloudless sky with blazing sunshine. It was windy in places but mostly felt hot while moving. 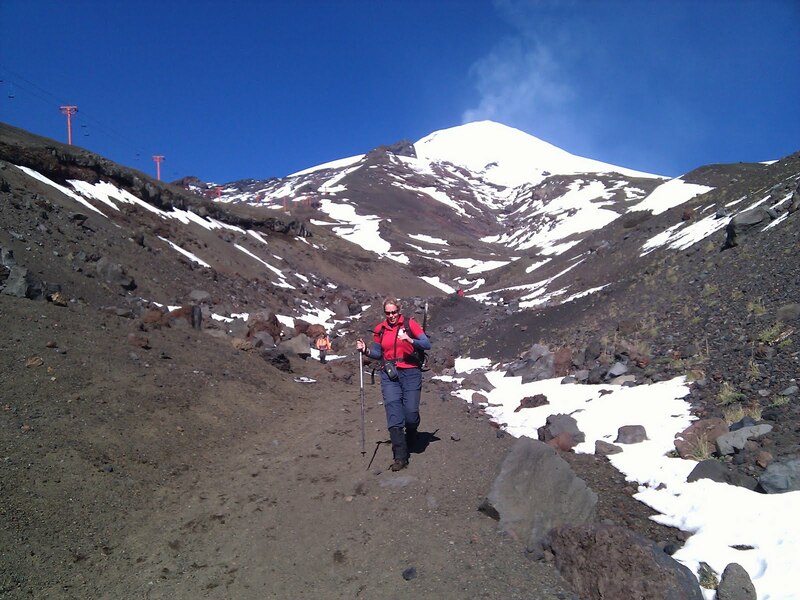 We continued the ascent, walking single file, following the guide, still swithing back and forth as the slope was too steep to ascend directly. Lago Villarrica, about 20km long, looked tiny and we could see a distant snowy peak, 120km away! 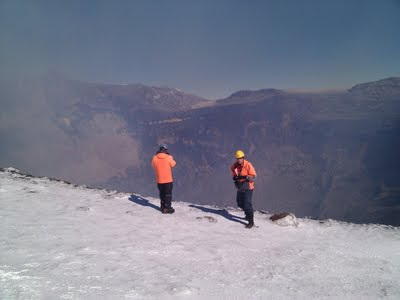 The top of the Villarrica crater was ever present and smoke could always be seen gently blowing away from the summit. The final hour of the climb was very steep, but we eventually reached the rim of the crater, 4.5 hours after leaving the car park, and with plenty of brief rest stops on the way up. The crater was steadily pouring acrid smoke and it was difficult to get close because of the smell, but it was a wonder to look at, imagining hot magma being blasted up into the sky. For the descent, we knew we were going to be doing some sliding down, but were unprepared for how fast or exciting it would be. The guide had us put on the fabric "nappy" - a sort of seat made from a tough material which strapped around the thighs and waist. Then we just sat down, with bent knees pointing downhill and let go, using the ice axe as a crude brake. This just about worked to slow us down on the steeper sections. With just a few walked sections to avoid the most dangerous drops, we slid all the way back to the top of the chairlift in no time at all. The final descent, a slightly different route to the way up, under the chairlift, was the most amazing downhill run. Steep, but on a soft gravelly soil which absorbed the impact. Leaning well back and letting my feet slide as they landed, I flew down this section back to the car park. The whole trip cost 35,000 Chilean Pesos, organised through the hostel. Highly recommended as long as the weather is good.